This video is promoting an extreme outdoor design with over 180 tons of natural stone for a large grotto waterfall and other water features around an extremely large pool. This outdoor design makes all our other projects look tiny. The pool is 12 foot deep, the size of three swimming pools and also includes a separate “winter pool” with a large spa. Our biggest natural stone grotto waterfall will be placed along with stone waterfalls around the pool. We will be filming this project daily and you will be able to see all the stone work for this pool in stages as it progresses. If you haven’t already, I recommend subscribing to this channel today because the transformation of this pool to paradise is going to be unbelievable and one of the most exciting construction projects you’ve ever seen! This swimming pool construction project will have all the natural stone set by Lucas Congdon and Lucas Lagoons master stone masons. The “Don’t Miss This Extreme Outdoor Design, 180 tons of Natural Stone, Large Grotto Waterfall in TX” video is part of a Video Series about the progress of this swimming pool construction project in Texas. This video includes Lucas Congdon going over different features in this ultimate outdoor design. We meet the client, Dr. Brian Owens, and see the pool contractor, Bejamin Krywick of 149 Pools building the pool shell. This outdoor design makes all our other projects look tiny. The pool is 12 foot deep, the size of three swimming pools and a separate “winter pool” with a large spa. Our biggest natural stone grotto waterfall will be placed along with stone waterfalls around the pool. We will be filming this project daily and you will be able to see all the stone work for this pool in stages as it progresses. If you haven’t already, I recommend subscribing to this channel today because the transformation of this pool to paradise is going to be unbelievable and one of the most exciting construction projects you’ve ever seen! This swimming pool construction project will have all the natural stone set by Lucas Lagoons master stone masons. This “Large Swimming Pool Build Begins Shooting Gunite in Pool Shell for this Outdoor Design in Texas” video is part of a Video Series about the progress of this swimming pool construction project in Texas. This video includes outdoor designer, Lucas Congdon, of Lucas Lagoons explaining the challenges of the stone work for this pool and spa remodel on Longboat Key, Florida. One big challenge was fitting the excavator in order to carry the large boulders alongside the house. The space was exactly as wide as the tractor and there was no room for error. This project is a swimming pool remodel with a natural stone grotto waterfall, spa remodel with multiple natural stone waterfalls, and more spillways and natural rock water features within the pool. This swimming pool and spa remodel includes a travertine decking with tropical landscaping on beautiful Longboat Key in Florida. This “Pool Construction Completed Fitting Several Tons of Natural Stone in a Small Area with Multiple Waterfalls” video is part of a Video Series about a swimming pool and spa remodel with a rock grotto and natural rock waterfalls by Lucas Lagoons in Sarasota, Florida. This video includes outdoor designer, Lucas Congdon, of Lucas Lagoons showing us the final touches to the stone work for the natural stone waterfalls and grotto in this pool and spa remodel. The Florida heat is still blazing down, the crew works hard, but progress takes a few days. In the end, the stone work is done and the pool is so close to finished. This project is a swimming pool remodel with a natural stone grotto waterfall, spa remodel with multiple natural stone waterfalls, and more spillways and natural rock water features within the pool. This swimming pool and spa remodel includes a travertine decking with tropical landscaping on beautiful Longboat Key in Florida. This “Finishing the Stone Work for this Multiple Natural Stone Water Feature and Grotto” video is part of a Video Series about a swimming pool and spa remodel with a rock grotto and natural rock waterfalls by Lucas Lagoons in Sarasota, Florida. This video includes outdoor designer, Lucas Congdon, of Lucas Lagoons showing the complicated process it can be for setting a large natural rock boulder for the grotto water feature in this pool and spa remodel in Longboat Key, Florida. The JCB barely fits into the back yard and the grotto rock is as large as the JCB. The heat is blazing and it takes three attempts, a few mishaps, and then the grotto rock finally gets into place. This project is a swimming pool remodel with a natural stone grotto waterfall, spa remodel with multiple natural stone waterfalls, and more spillways and natural rock water features within the pool. This swimming pool and spa remodel includes a travertine decking with tropical landscaping on beautiful Longboat Key in Florida. This “Complicated Process of Setting the Large Natural Rock Boulder for the Grotto Water Feature” video is part of a Video Series about a swimming pool and spa remodel with a rock grotto and natural rock waterfalls by Lucas Lagoons in Sarasota, Florida. This video includes outdoor designer, Lucas Congdon, of Lucas Lagoons showing the progress of the final stone work before the large grotto rock will be set the following day. The Florida rains come and go, but Lucas and his crew of master stone masons pushes on through the rain determined to meet the deadline for completing this pool and spa remodel in Longboat Key, Florida. This project is a swimming pool remodel with a natural stone grotto waterfall, spa remodel with multiple natural stone waterfalls, and more spillways and natural rock water features within the pool. This swimming pool and spa remodel includes a travertine decking with tropical landscaping on beautiful Longboat Key in Florida. 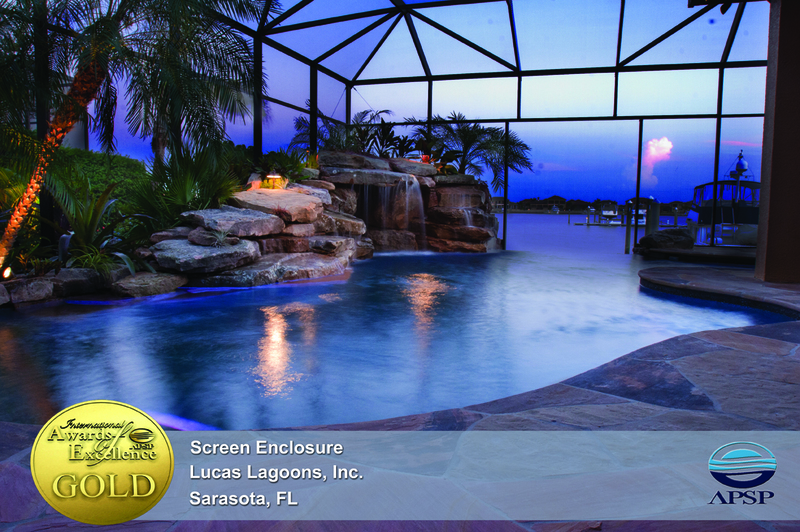 This “Stone Masons Set the Natural Stone so they are ready for the Large Grotto Next” video is part of a Video Series about a swimming pool and spa remodel with a rock grotto and natural rock waterfalls by Lucas Lagoons in Sarasota, Florida.